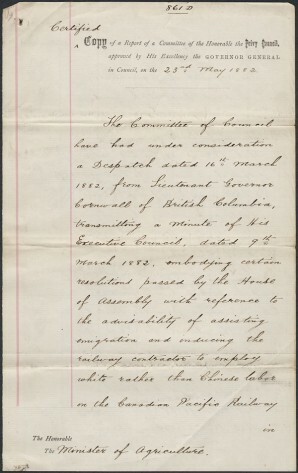 Report of council on utilizing white in preference to Chinese labour in British Columbia. Attitudes towards the Chinese varied throughout Canada, but by 1885 when the transcontinental Canadian Pacific Railway was completed with Chinese help, opposition – especially from British Columbia – began to colour views against their presence in the relatively young country. 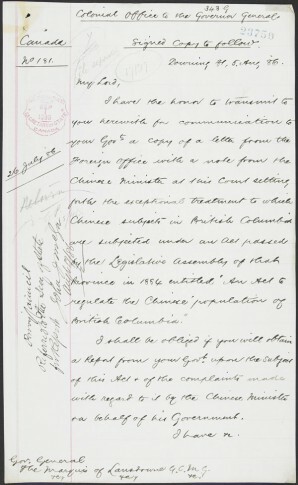 In a speech in the House of Commons, on May 4, 1885, Prime Minister John A. Macdonald argued for the exclusion of the Chinese from Canada, despite having earlier supported their presence during the building of the CPR. 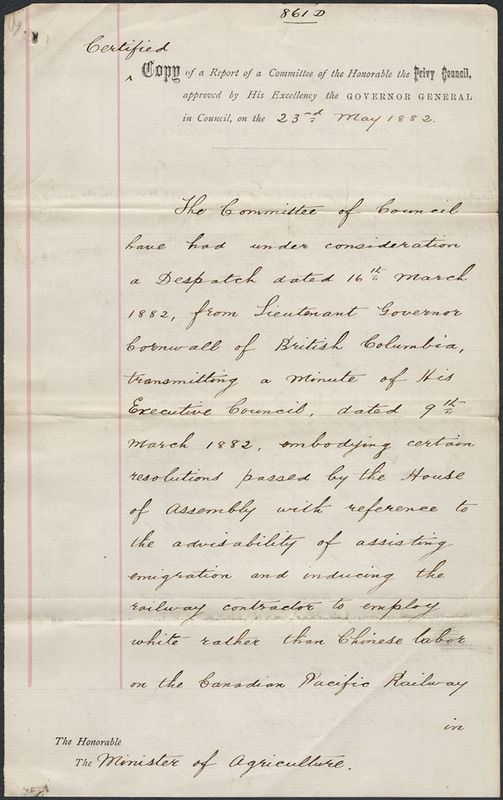 Macdonald’s comment, and misrepresentation of the intent of many Chinese immigrants to stay and settle in Canada, coincided with national debate on the “Chinese question” and the ongoing Royal Commission on Chinese Immigration (1885). While much of the testimony recorded by commissioners Justice John Hamilton Gray and J. A. Chapleau focused on racialization of the Chinese and their popular characterization as “perpetual foreigners,” the commissioners also interviewed the Chinese consul-general in San Francisco, representing the Chinese Imperial court. The commissioners also decided to embark on a fact-finding mission to California to study the American experience with the Chinese, with the full knowledge that the United States had passed its own Chinese Exclusion Act in 1882. 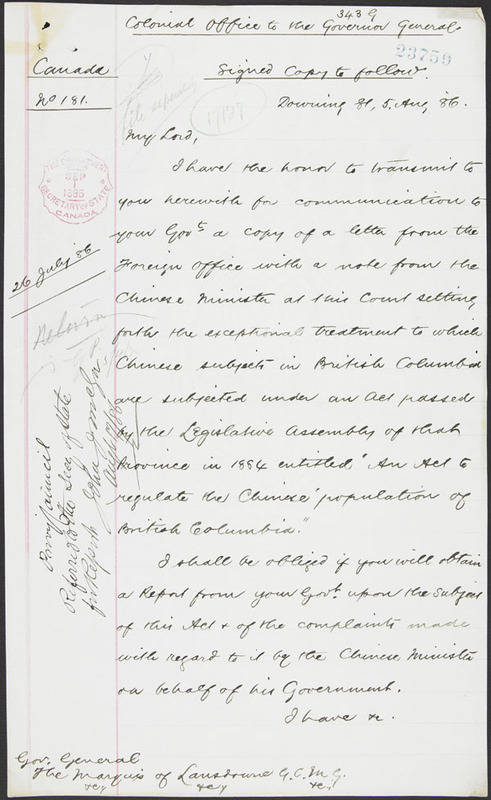 Clerk of Privy Council - Refers letter of Colonial Office to Governor General re treatment of Chinese subjects in British Columbia. Huang’s comments have nearly been forgotten in Canada’s official history, but they are important and stood as a warning against the subsequent decades of official racism against the Chinese in Canada that was largely supported through discriminatory legislation.